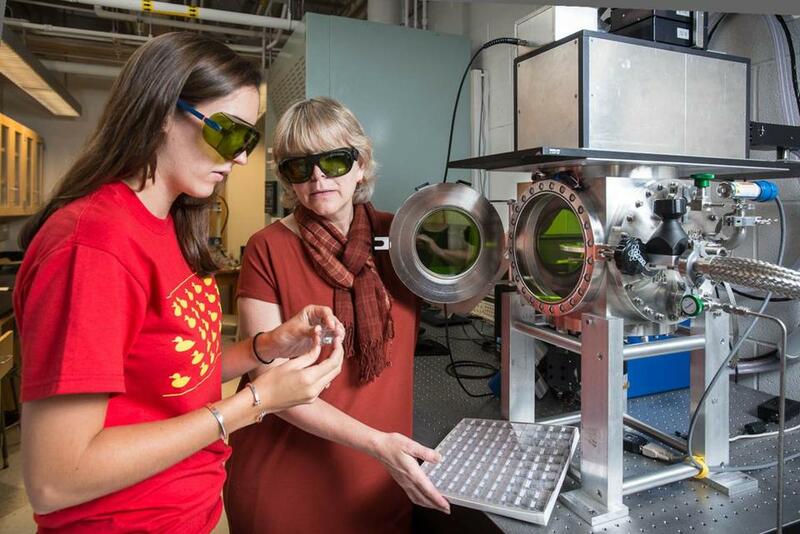 Alumna Erica Jawin (left) and astronomy professor Darby Dyar at work in a Mount Holyoke College laboratory. Earthbound instruments in local laboratories are poised to help scientists decipher the streams of data expected over the next two years from NASA’s latest Mars mission. 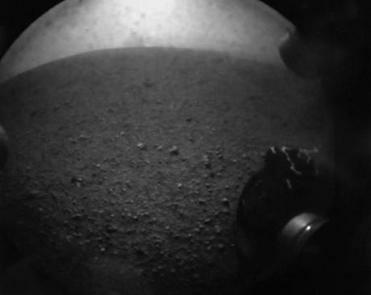 Much of the attention to the Mars Science Laboratory spacecraft has focused on the tightly choreographed maneuver required to get Curiosity, the car-sized rover, safely into the planet’s Gale Crater, which occurred in the early hours of Monday morning. But for a handful of local scientists on the mission’s science team, who began arriving at NASA’s Jet Propulsion Laboratory in Pasadena, Calif., last week, getting there safely was only the first step. After Curiosity’s systems are checked out and instruments tested, the rover will begin the brunt of its work for the next two years: traversing the surface, taking images with its many cameras, drilling and scooping samples, and shooting rocks with powerful laser pulses to analyze their chemical makeup. Using doppelgangers of some of the instruments on Mars in laboratories on earth will help scientists understand and interpret data. Here, they can analyze a range of substances and use the results as a kind of benchmark to understand what the rover is seeing on Mars, which should begin to unravel the history of the planet, in particular of the presence of water on it. “It’s basically like reading a history book of Mars; we’re going to learn when water was on Mars, and if it existed for a long time,” said Darby Dyar, a professor of astronomy at Mount Holyoke College who is a member of the science team. The robotic explorer steered itself to a gentle landing inside a giant crater for the most ambitious dig yet into the red planet’s past. “We’re getting really close to knowing if there was ever life there. How much more an important question could there be?” she said. Dyar is focused on one instrument aboard the rover, called ChemCam. The device has a powerful laser that Dyar compares to experiments conducted by high school students who place a substance in a flame and then observe the flame’s color to discern what the substance is made of. For example, put sodium in a flame and it glows an intense yellowish orange. ChemCam does that on a much more powerful and long-distance scale, shooting its laser beam at rock or soil, heating it to about 3,600 degrees Fahrenheit, and detecting the chemical components of the target from the resulting flash of light, from as far as 23 feet away. The rover will take as many as 10,000 such readings over its two-year mission, Dyar said. Where her laboratory at Mount Holyoke College will come into the picture is in making sense of the data the rover sends back. In her laboratory sits a vacuum chamber that can maintain Mars-like conditions: very low pressure and a carbon dioxide atmosphere. In it, she and her students have begun carrying out measurements on a library of 10,000 rock samples. The diverse array of minerals will be a helpful reference set, allowing scientists to better understand the rocks, soil, and dust that the rover is sampling. At geobiologist Roger Summons’s laboratory at the Massachusetts Institute of Technology, an oven heats up soil samples, allowing another instrument to detect the presence of organic compounds, seen as hallmarks of an environment suitable for life. The spacecraft will do the same thing to select samples, so scientists will be able to compare the measurementson Mars to ones they make on well-characterized substances in their lab on earth. “The instrument package is effectively as close [as it can be] to a field geologist who might be exploring early Earth, looking for clues about the environment,” said Summons, who like other members of the science team will live on Mars time, with days about 40 minutes longer than on earth, so they can better coordinate and direct the rover’s activities. Ralph Milliken, an assistant professor of geological sciences at Brown University, has seen the potential and the limitations of using a rover on the planet. A few years ago, in a simulation scenario near the Guadalupe Mountains in New Mexico, Milliken worked as if he were the rover. The science team, operating remotely, would receive only the data he sent them, including images like the ones the rover might collect on the surface of Mars. Then, they would provide commands about what to explore more in depth and which samples to collect. He said the exercise, which was mainly to familiarize the science team with the kind of control they would have once the rover was on the surface of Mars, also demonstrated to him some of the limitations of depending on a rover, instead of having a human walk around, picking up rocks and observing the environment firsthand. “I definitely smiled a few times, when they’d choose certain rocks over another, because it was very curious — things look different in real life, versus images,” Milliken said. Now, Milliken is a member of the science team and is most interested in understanding how the small amount of water present on Mars cycles through its environment, using equipment aboard the rover, including a detector that can measure the distribution of water in the soil. The rover will first explore the area where it lands. Then, it will climb a mountain in the crater, called Sharp Mountain — sampling, photographing, and doing chemical and other analysis of the mountain’s sedimentary layers as it goes. John Grotzinger, the chief scientist of the mission, said that the larger goal is to look for environments that could have been habitable, and to illuminate the history of the planet.